Allahabad, the city of sacred baths. A tour to this place is a must for every visitor who ventures to India. Allahabad, the city of sacred baths. Allahabad, culturally known as Prayaga, is eulogized in Puranic mythologies as the ‘Tirtharaja”, the king of all sacred places. Situated picturesquely at the confluence of the Ganga, Yamuna and the invisible Sarasvati Rivers, it is one of the three holy cities symbolizing the pillars of the bridge to heaven. The other two pillars are Varanasi and B’Gaya. 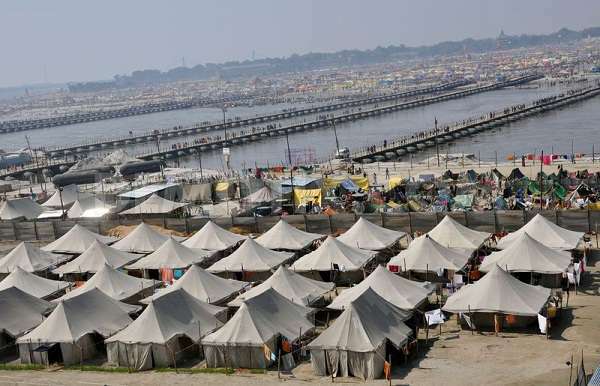 People from different parts of India come here to bathe in the sacred waters of the confluence (called Sangam) and every twelve years they come in their hundreds of thousands to the world’s greatest religious bath-fair, the Kumbh Mela. A tour to Allahabad is a must for every visitor who ventures to India. The city has various attractions to offer visitors. Allahabad tour is good to start between 07:00-10:00. If you have any special requirements, please let us know, we will do our best to assist you! (extra person @ INR 1000/-). Duration of tour: 8-10 Hrs. The tour includes a comfortable, air-conditioned vehicle with cold mineral water available. A knowledgeable & experienced tour guide will meet you at your hotel or guesthouse and accompany you to Allahabad. All toll taxes, parking fees, the cost of the driver and guide expenses are also included.